October 23, 2013 (SOUTH BURLINGTON, VT) - Logic Supply's fanless NUC, the www.logicsupply.comML300, has returned from the Intel testing lab as the clear leader in fanless Next Unit of Computing systems. In exhaustive Intel testing, the ML300 was the first and only fanless NUC to maintain performance in ambient temperatures exceeding 30°C. Standard configurations of the ML300 reached 40°C and with the addition of Logic Supply wide-temperature components the computer was verified for a staggering 50°C, without CPU shutdown, wifi failure, or data corruption. 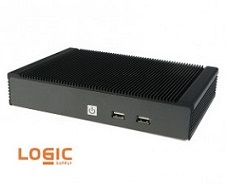 “The ML300 is by far and away the top thermal performer of all fanless NUCs verified by Intel,” said Logic Supply lead Hardware Engineer Rodney Hill. Based on Intel’s Next Unit of Computing form factor, the ML300 allows for unprecedented performance in a compact footprint. Measuring 196 x 37 x 131 mm ( 7.7” x 1.45” x 5.17”), the ML300 is completely fanless and ventless, protecting against dust, metal shavings, or other debris in industrial applications from sawmills to machine shops. Removing the fan removes a point of failure, creating a solid state solution with no moving parts that will outlast commercial PCs. Intel‘s Industry leading thermal testing is rigorous, thorough and grueling. Systems are subjected to extreme conditions, while components are monitored for their operating temperatures. A well engineered system will keep internal components below their fail points as the testing proceeds. The ML300 does just that with it’s one-piece extruded aluminum lid, creating a single-interface heatsink providing optimal heat transfer and giving improved cooling performance seen in the Intel testing. Additional heatsinks for storage and Wi-Fi ensuring optimal reliability for these individual components, even during write-intensive or network-intensive operations. The ML300’s can be reconfigured, branded and customized to set to specific requirements without from-scratch development fees and timeframes. The control over the design and manufacturing allows Logic Supply to manage the lifecycle and revision history, ensuring a reliable, consistent solution. Featuring a unique expansion bay, the ML300 can do what other NUC systems cannot: offer expansion in the form of uniquely industrial I/O. Three screws allow easy access to the internal components and an EMI gasket reduces the risk of electromagnetic and radio frequency interference. Swappable backplates support current and future NUC motherboards, while offering space for up to three wireless antennas as well as an extra RS-232 COM port. To learn about additional configurations including 2.5” HDDs or a wide-input power supply with vehicle ignition sense, visit www.logicsupply.com.